I have been so excited to share this super cute poncho outfit with you guys! It's from Ilymix.com and you can shop my exact one here. They have such good accessories! You've probably heard me talk about them before because I also have a gorgeous geometric blanket scarf and brushed fringe camel scarf from them. You can see the blanket scarf styled here and the camel scarf here. They put different items on sale almost daily so sign up for their emails so you can be notified! You can always use my code "PAIGEB20" for 20% off your entire order, and they always have free shipping! 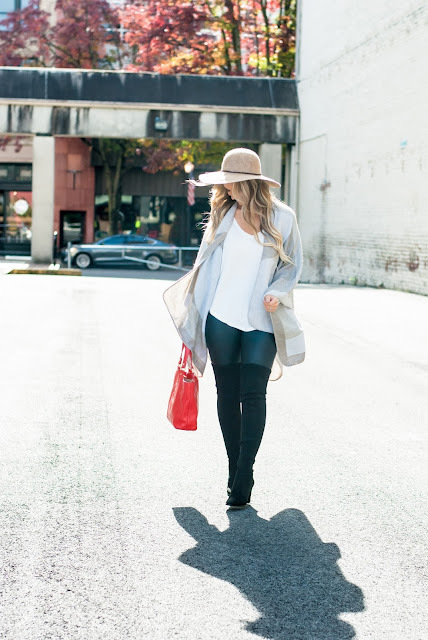 You've GOT to get this pair of leather leggings while they're 40% off and fully stocked before they're sold out! For some reason, I expected them to be the same material on the inside as they are on the outside, but that's not the case. They're some sort of soft polyester material, super stretchy, and super easy to get on and off. They run true to size! I'm wearing a small, which is what I usually get in most leggings. Here are some of my favorite pins of leather leggings outfits, they can be styled so many ways! Fyi, I'm wearing a L in my white long sleeve tee for extra length. It's 40% off right now with free shipping!